A funny, foul and fascinating book of awful animal antics! From pongy porcupines to poo-slinging monkeys, it’s a jungle out there! Now – animals aren’t taught to be polite like us humans are. Their mums don’t make them wash behind their ears, flush the loo or brush their hair. So their gross behaviour is bound to give you a laugh – and a scare! 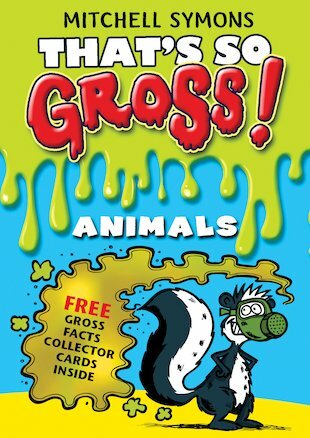 In this collection of hilariously wild trivia, you can arm yourself with animal facts such as: why angry monkeys fling poo at each other; why ostriches pee on their own legs; and how many hearts a squid has. From the one-and-only Mitchell Symons, it’s the most revolting reference ever! I am wondering what this book will be like… Actually, I think it will be…DISGUSTING!!!!!!!!!!!! it looks cool and funny.